The PHH-103A model has been discontinued. Please see the PHH103B as a possible alternative or contact our Flow Engineering department. The PHH-103A is a portable, microprocessor-based temperature meter. Its rugged, splashproof housing makes it ideal for field applications. 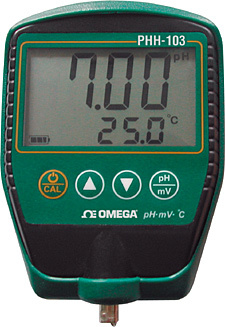 On its large, 2-line LCD, the PHH-103A can display pH/mV and temperature readings simultaneously. Up to 5 buffer values can be stored in memory, allowing for fast, accurate calibration. Calibration (1-point, 2-point, etc.) is user adjustable. The display will indicate the percentage of slope (“PTS”) to show the status of the electrode after slope calibration. The PHH-103A also features a low-battery indicator and will automatically shut off after 10 minutes of non-use. Easy mounting is accomplished with the large magnet on the back of the meter or by mounting hole on top of the meter. A suction cup mounting hook is supplied with the meter. 참고: Comes with hard carrying case, rubber boot, pH/temperature electrode, small suction cup electrode holder, 4 pH and 7 pH buffer solutions, suction cup mounting hook, and 9 V battery and complete operator’s manual.